This model has replaced the SS shackle model. Our ParaCord Survival Bracelets are made with up to 16' of 550# military spec paracord. They contain approximately 1.75' of paracord for every inch (wrist size) ordered. In an emergency situation, you can unravel the bracelet and deploy the paracord for use. If you do use your Survival Bracelet, simply send what is left back to survival straps, along with your harrowing story of survival, and they will make you a new one, free of charge (shipping charges will apply). Whether you are hiking in the woods, stranded on an island, at the range, climbing a mountain, or running errands around town, you will always have several feet of 550 lb. test paracord with you at all times. Oh yeah, they also look incredible! Our Survival Bracelets come with a marine grade stainless steel shackle for attachment purposes. If you are looking for a very unique, stylish, and functional piece of gear, that is great for everyday wear, this one is for you. Adjustable - The stainless steel shackle makes our Survival Bracelets adjustable. We will build your bracelet for your specific wrist size. However, you can now adjust it on your wrist to wear it as loose or as tight as you would like. There are 3 settings for adjustment. Simply insert the shackle pin into whichever hole you would like to achieve the fit you are looking for. Standard Break-Away Feature for Safety - Many of our customers love wearing our Survival Bracelets, but are concerned wearing them around machinery, or anything they could get their bracelet, and their arm, "hung up" on. 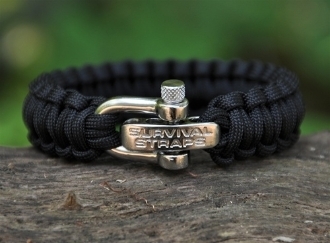 SurvivalStraps Bracelets now come standard installed with a break-away pin. This pin is tough enough for everyday use, but it is designed to shear off and "break away" from your wrist when a significant force is applied. This adds a safety factor to wearing your Survival Bracelet. Standard Stainless Steel Pin - SurvivalStraps are all about strength in every way. Because of this they also come standard with a marine grade stainless steel pin. You can choose to install the stainless pin, instead of the break-away pin, if you want your Survival Bracelet to be one of the strongest items on the planet!!! Installing this pin gives the stainless shackle hundreds of potential uses in an emergency situation. Even if you wear your SurvivalStrap with the break away pin feature installed, you can keep the stainless pin handy if you need to deploy the paracord and the shackle in an emergency situation. Rounded Knurled Pin - Both the break-away pin, and the stainless pins on the SurvivalStrap shackles are rounded. This helps to make sure your bracelet will not snag on anything like clothing. The pins are also knurled so that you can get a good grip while twisting them. Stamped In Steel - SurvivalStraps is stamped into our stainless shackle closure. Just so you know who's got your back!!! Measure your wrist and select your size based upon your wrist size in inches. In stock colors are listed. Please do not give us the length you would like. Give us your WRIST measurement. To measure, use a string to wrap around your wrist and then measure the string. Let us know this exact size. If you are in between sizes, pick the larger size. We make the Survival Bracelets large to fit. If yours is to large when you receive it, you want to shrink it down. Wear it in the shower or soak it in a sink a couple of times. Get it completely soaked and let it dry out. Within a couple of days, it will shrink down by approximately 1/4" and should give you a comfortable fit. Please keep in mind that the average wrist size for a male is 7" - 8", and average female wrist size is 6" - 7". If you are above or below these sizes, please double check your wrist measurement to confirm the size.? We can do custom colors sizes. Select the custom color option and tell us what you want in the comments section of your order or send us an e-mail.